From left to right: Nathan Claus, Ferry Unardi, Zhanibek Datbayev, Emil Stefanov, Prakhar Gupta, Tomek Czajka, and Prof. Patrick Eugster. 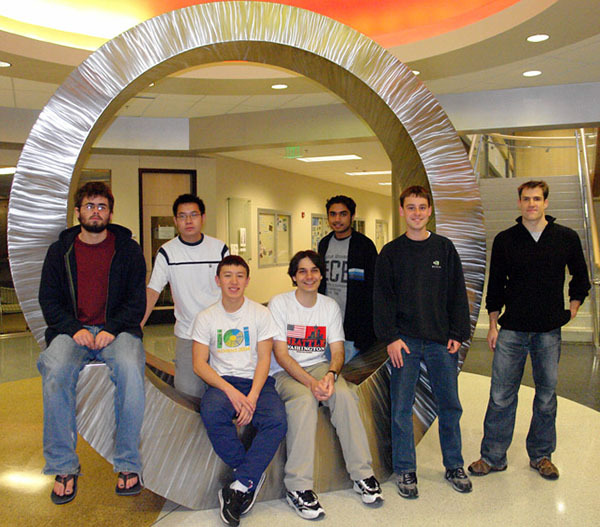 Two Purdue programming teams will compete in the ACM Regional Programming Contest on November 11, 2006. Under the guidance of coach, Tomek Czajka, the Boilermakers Black and Boilermakers Gold will battle for the top spot. Members of the teams were selected from a local contest organized by Tomek. Boilermakers Black are the top three students from the local contest. Team members include Nathan Claus, Zhanibek Datbayev, and Ferry Unardi. Ferry competed in the 2005 ACM contest where the Purdue team came in 7th. Ferry is a junior in CS and a member of the Purdue ACM Chapter. Zhanibek is a Computer Information Systems Technology transfer student from Kazakhstan. A freshman at Purdue, Nathan is an Engineering student. Team Boilermakers Gold are the three students who placed 4-6 in Tomek's local competition. Members of the Gold team include Emil Stefanov, Prakhar Gupta, and Kester Laurens. Kester is a sophomore in CS and Prakhar is a junior in Computer Engineering. Emil is a junior at Purdue and a second-year CS student. He also competed in the 2005 regional competition where Purdue ranked 7th. Boilermakers Black and Gold are joining teams from the East Central North American region in Cincinnati, Ohio. Participants come from western Pennsylvania, Ohio, Michigan, eastern Ontario, and Indiana. The goal for contenders of the regional contest is to rank within the top three spots in the competition. The top three teams will advance to the ACM International Collegiate Programming World Finals. The world finals will take place in Tokyo, Japan in March 2007. Purdue sponsored a team of three students in the 2005 competition where they ranked in the top ten. Hong Chen was the third member of the Purdue team but was unable to compete this year due to contest age restrictions. For more information about the 2005 competition visit https://www.cs.purdue.edu/news/2005/programming-contest.html. The Boilermakers Black and Gold will be bringing a few fans to the competition. Assistant Department Head, Dr. Tim Korb, ACM Faculty Advisor, Prof. Patrick Eugster, and PhD student, Jacques Thomas will join the teams in Cincinnati to cheer them to victory. Good luck Boilermakers Black and Boilermakers Gold!